The mammalian heart has generally been considered to lack the ability to repair itself after injury, but a 2011 study in newborn mice challenged this view, providing evidence for complete regeneration after resection of 10% of the apex, the lowest part of the heart. In a study published by Cell Press in Stem Cell Reports on April 3, 2014, researchers attempted to replicate these recent findings but failed to uncover any evidence of complete heart regeneration in newborn mice that underwent apex resection. The resected area is still missing and scarformation (red) is seen in the border of the resection line. Red: Non-muscle myosin, green: Desmin, blue: Dapi. Cardiovascular disease is currently one of the leading causes of death worldwide, and scientists have mainly attributed this high mortality rate to the inability of the mammalian heart to regenerate after injury. Novel therapies capable of enhancing the heart's ability to recover after a heart attack or other type of injury are urgently needed. That's why a 2011 Science report from Porrello et al. 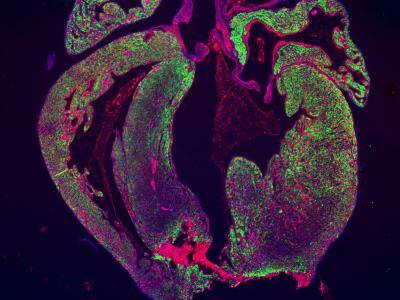 that provided evidence of complete heart regeneration in newborn mice attracted a great deal of attention and raised hopes for identifying factors that could improve heart regeneration. This study prompted Andersen, Søren Sheikh, and their colleagues to look for factors that enable heart regeneration, but they were surprised to find no signs of true heart regeneration in newborn mice that underwent apex resection. Three weeks after this procedure, the damaged hearts were about 10% shorter and weighed 14% less than the hearts of control mice that underwent the same surgical procedure without apex resection. Moreover, the damaged hearts had large scars and lacked proliferating muscle cells crucial for restoring heart function. The apex is still missing in AR hearts and scarformation with connective tissue and fat is seen. "The notion of mammalian heart regeneration has given a lot of hope in the scientific community for finding important factors that may be used for improving adult heart regeneration," Andersen says. "We hope that our study will add another view on this important matter and spur a lot of studies from other independent labs that may shed further light on this controversial area of research." The AR heart is more rounded and the apex is line by a scar coposed of Collagen (red).